Susan Page's 'The Matriarch' Presents Barbara Bush As Indispensable To Two Bush Presidencies Beyond the juicy bits, journalist Susan Page paints a larger portrait of one of the more underappreciated, least understood figures of the last century — one with both insecurities and influence. 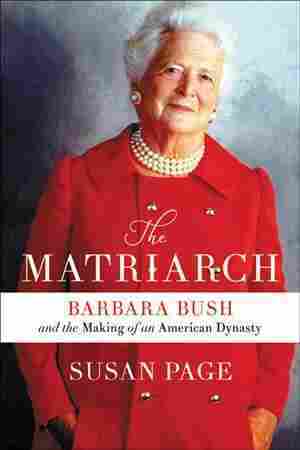 Barbara Bush didn't want the title of Susan Page's The Matriarch to be called that. The former first lady had instead suggested "The Fat Lady Sings Again" when the USA Today Washington bureau chief and veteran journalist asked her what she thought the title should be. Page conducted several interviews with Bush just ahead of her death almost a year ago. It was a classic example of Bush's acerbic wit — just like when she famously cracked in 2013 that "we've had enough Bushes" when asked about the possibility of her son Jeb running for the White House. She would often play down any dynastic elements of her family. Jeb Bush eventually did run (Spoiler alert: It didn't go so well.) and the former Florida governor wasn't too pleased by her off-the-cuff remarks at the time. Much emphasis will be put on the juicy details Page reveals about the depth of Barbara Bush's disdain for President Trump, the man who would wallop Jeb in the 2016 GOP presidential primary. It's understandable Bush would hold a grudge against a man who had attacked not only, mercilessly, her son — but also her husband and, truly, the entire family she'd worked for decades to protect. She wrote in Jeb on her last presidential ballot, while George H.W. Bush voted for Hillary Clinton (his first-ever vote for a Democrat), who was also the wife of the man who vanquished him in the 1992 election. Barbara Bush's antipathy ran deep. She blamed Trump for her heart attack in the summer of 2016, had a countdown clock a friend had given her ticking down to the end of Trump's term, and said she didn't even consider herself a Republican in the final months before her death. And, yes, those are all important tidbits about the final years of her life, where she saw a chasm growing between the Republican ideals and the honorable life her family — especially her husband of 73 years and her eldest son — had tried to live up to. But the book paints a larger portrait of, perhaps, one of the most underappreciated, least understood figures of the last century — one who vitally shaped two presidencies. Bush's remark to author Page about being the "fat lady" may have been a way of trying to use humor, as she often did, to deflect many of the deep-seated insecurities that had plagued her throughout her life: ones about her weight; her worth; and, ultimately, her very womanhood and life choices in an increasingly feminist world. To answer the question of where that self-doubt arose, Page traces Bush's lineage back decades to before she was even born. While that may seem tedious at times, it makes sense to look at the forces that shaped Barbara Pierce before she even met a young George Herbert Walker. It may not be surprising to other women, especially, that a complicated, fraught relationship with her mother may have impacted her the most, even if she didn't recognize it at the time. Her mother, Pauline Pierce, was a tall, slim beauty who especially doted on Barbara's older sister Martha, who had a similar physique. Bush saw herself as the dumpy, plump younger sister and would often note in her diaries — even years thereafter — that someone was slender as one of the first attributes that she liked about them. Those insecurities, however dormant, would continue to be stirred at various points throughout her life. Her husband's campaign advisers worried after she stopped dyeing her hair that she looked older than George H.W. Bush and that "her matronly looks undercut his message that she represented a new generation of leaders." Page writes that they privately wondered whether they should push her to lose weight or wear more fashionable clothes. Barbara Bush would retort years later: "What you see is what you get. ... People who worry about their hair all the time, frankly, are boring." Her feud with her White House predecessor Nancy Reagan also seemed to, in part, turn on her more matronly appearance compared to the slim onetime actress, but the fact that Bush was so blunt and forthcoming definitely stoked the simmering tensions between the two. Bush is also frank about a deep, depressive episode that nearly drove her to suicide after they returned from her husband's post in China, as he led the CIA. He could no longer share his work with her, and there were rumors that would persist for years that he was having an affair with his longtime aide Jennifer Fitzgerald (both would repeatedly deny any romantic relationship, and Page often probes it; one source tells her the two did have an extramarital affair). Page writes that Bush's "vulnerability was at odds with her image as confident and resilient — as someone more likely to intimidate others than to be intimidated by them, or by life." But truly, one can put up a facade for only so long, and Bush would tell Page years later that she "would pull over and park so I wouldn't go hit a tree. I mean, I really felt that depressed." Bush made the traditional choice to marry and have children, as most women of that World War II generation did. George H.W. would never consult her on many of their most important decisions — moving to Texas, then running for Congress, taking on the chairmanship of the Republican National Committee, then the ambassadorship to China, the head of the CIA, and eventually running for president. He simply knew she would go along. Some of those choices would be put under a microscope during her husband's White House term, when Barbara was asked to give the commencement speech at Wellesley College, the liberal all-girls school that Hillary Clinton had attended. Protests ensued after she was chosen, with some arguing she was only famous for the person she had chosen to marry, not for anything she had done. In the end, her address received plaudits — particularly a joke she made at the end that "Somewhere out in this audience may even be someone who will one day follow in my footsteps and preside over the White House as the president's spouse. ... I wish him well!" But clashes like that made her bristle for decades at whether or not she was a feminist. The truth is, Barbara Bush had an immeasurable impact on her husband's decisions both before and during his White House term. She truly was his most trusted adviser, Page writes, and at times pushed him in different directions that likely altered the course of American history. During his 1988 campaign, when advisers wanted him to go negative against Massachusetts Gov. Michael Dukakis for his release of convicted murderer Willie Horton, who then raped a woman while he was out, George Bush was hesitant. It was Barbara who gave him the final OK (the most infamous "Willie Horton ad" that was decried as racist would be run by an outside group). She would forge a friendship with Raisa Gorbachev as tensions with the former Soviet Union were thawing, which certainly helped in her husband's foreign policy. And she was fiercely protective of her son when he was in the White House, rightly skeptical that he was receiving bad intelligence and advice on Iraq. She pushed her husband to act on the deepening AIDS crisis, which his predecessor Ronald Reagan had not done. For this, she saw parallels to their family's deepest crisis — the death of their daughter Robin at age 3 to leukemia. With little known about childhood cancers back in the 1950s, many in Texas treated her like a pariah, skeptical about touching or being around her for fear they could catch "the disease." Decades later, Barbara Bush saw similarities in how young AIDS and HIV patients were being treated as lepers of society. "Through the simplest actions — cradling a baby, attending a funeral, lighting a candle, writing a letter — Barbara Bush challenged public attitudes about gays and HIV/AIDS," Page writes. It's a crusade that her son George W. Bush would embrace through his PEPFAR program and her namesake granddaughter, too, during her work in Africa. At times, Bush would bury her own political views if she knew it would hurt her husband. She deeply thought out her position on abortion rights decades ago and concluded that she supported a woman's right to choose — and again, it had to do with daughter Robin. Writing in her diary that she "vividly remember[ed] that split second, that thin line between breathing and not breathing, the complete knowledge that her soul had left and only the body remained," she compared that to the moment of Robin's first breath at birth — and believed that was the moment life began, not at conception. But she would keep those views to herself, with the knowledge that it could harm her husband in an increasingly conservative party. Ultimately, as her family well knew, Barbara Bush wasn't this mild-mannered, pearl-wearing, doting grandmother who baked fresh cookies (she was a very bad cook, in fact). She was an inseparable part of her husband's success, even though she would be wont to downplay it. In her closing epilogue, Page asked many in the Bush family whether they thought either George H.W. or George W. would have become president without her. Barbara herself said that of course they would have been, but Bush top aides and even her husband's successor Bill Clinton — whose eventually close relationship with her husband she would begrudgingly accept — vehemently disagreed. That's a hypothetical that will never have an answer. But Page settles on another adjective to describe the late first lady's place in both her family and in American history: "indispensable." It's another moniker Bush herself would probably shun and downplay, but it's appropriate and fully earned.